The band’s incendiary live show, declared by NPR as “seamless whenever and wherever they’re on stage” has brought the band to major festivals and venues internationally including Bonnaroo, Austin City Limits, North Sea Jazz Festival (Curacao and Rotterdam) and Lowlands in the Netherlands, Kennedy Center, London’s O2 Arena, Montreal Jazz Festival, WOMEX, WOMAD, Tempo Latino (France) as well as two tours to Kuwait and Iraq to entertain US troops and a recent tour in Pakistan and Qatar. Their diverse spectrum of devoted fans speaks to the ensemble’s universal appeal beyond just Latin or world music. In addition, they have served as the backing band for and collaborated on several occasions with the late, great, legendary Prince (ALMA Awards on ABC, Golden Globes, CBS Super Bowl Bash, 21 Nights in London), Fania All–Stars pianist Larry Harlow, Sheila–E, GZA of Wu–Tang Clan, Maceo Parker, Curt Kirkwood of the Meat Puppets, Ruben Ramos, GZA of the Wu–Tang Clan, cult–hero Daniel Johnston, indie rock standouts Spoon, Los Lobos and many others. In 2015 and 2016 they continued to tour the globe with club and festival dates in support of their latest studio release, Problemas (Blue Corn Music); their 6th full–length album produced by Multi–Grammy award winner Steve Berlin of Los Lobos and released in late 2015. Additionally, they have appeared on the nationally syndicated PBS show Austin City Limits 3 times (2016, 2014, 2007). Their music has also appeared in films and movies including Breaking Bad (AMC), Weeds (Showtime), Frankie & Gracie (Netflix), Law & Order (NBC) as well as the John Sayles’ film Casa de los Babies among others. 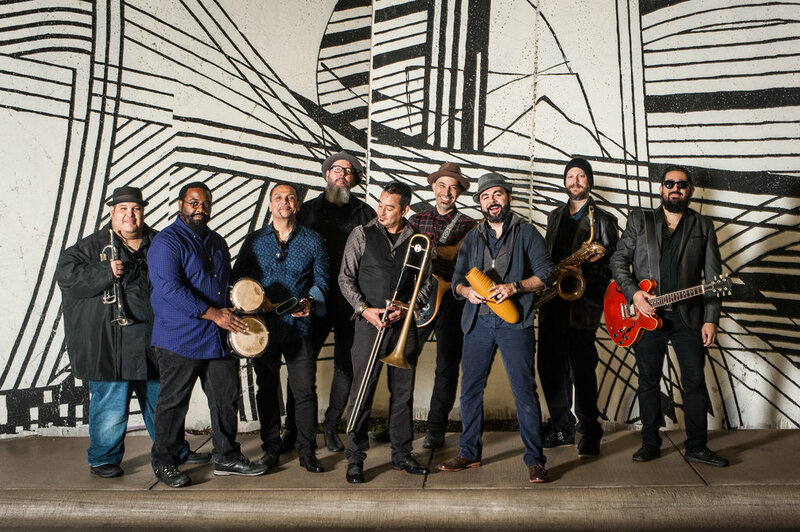 The nine-piece collective formed in 2000 in Austin, Texas and consists of Jose Galeano (timbales, vocals), Kino Esparza (vocals, hand percussion), Beto Martinez (guitar), Greg Gonzalez (bass), John Speice (drums), Matthew “Sweet Lou” Holmes (congas), Gilbert Elorreaga (trumpet), Josh Levy (baritone saxophone) and Mark “Speedy” Gonzales (trombone).